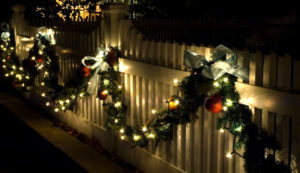 Accenting your fence over the holiday seasons creates a warm and inviting feel to your home. 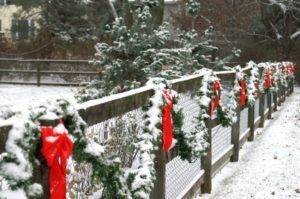 Even a chain link fence can be given a boost when the weather is cold and frightful. 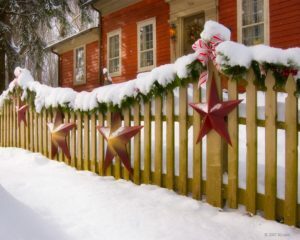 Adding a wreath to your door is lovely, but have you ever consider adding a wreath to your fence? It is as a classic way to add some spirit to your fence. Don’t just stop with wreaths, you could also drape garland along your fence. Both garland and wreaths last for a very long time, keeping the cheer even after the holidays have come and gone. Red ribbon added to an aluminum fence adds a nice pop of color against the stark black fence and the crisp white snow. Lights are a go to for most homes during the holidays. They are a cheap and bright way to add a little something extra to the look of your home and fence. Consider adding winter containers strategically around your fence. Imagine a bundle of lights woven into your planters? Go for the big show, and combine wreaths, garland, ribbon and lights. Make a statement your town will never forget. 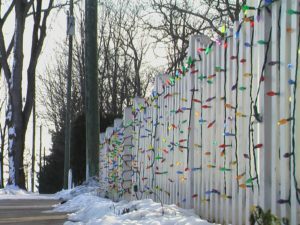 No matter what your preference for holiday decorations, your fence can add a nice cheerful framework for the holiday season. Capital Fence loves seeing how creative our customers are when it comes to décor.